On November 30, 1988, the live-action sitcom Good Morning Miss Bliss premiered on the Disney Channel. The series was cancelled after five episodes, with thirteen episodes having been completed; the series then moved to NBC and was retooled as Saved by the Bell, which became a huge hit for the channel. Good Morning Miss Bliss featured stories about teachers and students, while the latter focused on just the students. The episodes of Good Morning Miss Bliss were added to Saved by the Bell’s syndication later on. The series was created by Sam Bobrick, and featured Hayley Mills as Carrie Bliss, Dennis Haskins as Principal Belding, Mark-Paul Gosselaar as Zack Morris, Lark Voorhies as Lisa Turtle, Dustin Diamond as Screech Powers, Max Battimo as Mikey Gonzales, and Heather Hopper as Nikki Coleman. The first episode, “Summer Love,” begins at John F. Kennedy Junior High School in Indianapolis, Indiana, with the new school year having just started. Zack Morris greets his friends Mikey and Screech, and brags about hanging out with a ninth grader all summer long, as he pretended he was in the ninth grade as well. His other friend Nikki is rather critical of Zack’s lies, but her friend Lisa argues that everyone lies in the matters of summer love. Carrie Bliss, their teacher, is talking with her fellow teachers about their schedules, and she talks with Principal Belding, who asks her to cover for him at the PTA meeting, but she declines, as she has a date. As Miss Bliss helps a new student to their classroom, they run into Zack in the hallway, and he is shocked to see that the new girl is Karen, the girl he met at camp. The two nervously chat, and Zack comes up with more lies to tell her to cover for the fact that he isn’t a ninth grader. Things get worse when Miss Bliss tells him that he’ll be announced as the eighth grade representative at the assembly that afternoon, but he shockingly announces that he resigns. During lunch, Zack eats with Karen, while Belding joins Miss Bliss at her table. He again tries to guilt her into taking his place at the PTA, but with no avail. Zack and Karen run into Lisa and Nikki, with Nikki trying to ruin Zack’s lie surreptitiously. As the bell rings, everyone heads to class, but Miss Bliss asks to talk with Zack for a moment. She asks him why he turned down being the student council representative, and he comes clean. Zack’s worried that Karen will dump him if he tells the truth, but Miss Bliss tells him that she’ll find out sooner or later. He tries to tell Karen the truth, but chickens out when she invites him over while her parents are away that weekend. Unfortunately, Karen finds out the truth on her own, and she walks away angrily. As Miss Bliss sits in her classroom, Belding once again tries to convince her to take his place at the PTA meeting, but she turns him down again. That night, Miss Bliss is getting ready for her date when her friend Tina arrives. Miss Bliss tries to get Tina to leave, but her date arrives before Tina can leave. Fortunately, she sees herself out, and Miss Bliss and her date enjoy their evening. As she goes to get dessert, Zack arrives at her backyard. He confides in her that Karen dumped him. Miss Bliss takes time from her date to help Zack, and she helps him understand that this kind of pain is a part of life. Her date walks in on them talking, and when he says that he has to go, she tries to convince him to stay, thinking that her life as a teacher scared him away. Fortunately for her, he just had an emergency at work, but would love to see her again, and thinks she’s a wonderful teacher. Posted in Uncategorized and tagged 1980s, Cancelled, Color, Disney Channel, Live Action, Television. Bookmark the permalink. On November 29, 2006, the touring production of High School Musical: The Concert began its run in San Diego, California. 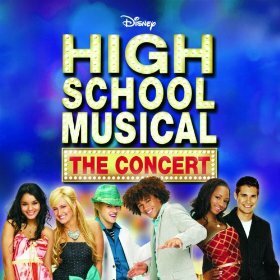 Based on the highly popular Disney Channel Original Movie, the tour featured most of the original cast, save for Zac Efron, who was off filming the movie Hairspray. Efron’s character Troy was played by Drew Seeley. The international tour reached forty cities in the United States, Europe, and South America. A special recording of the tour premiered as a one-hour special on Disney Channel on May 4, 2007; a DVD and CD of this recording was made available on May 1. The concert also featured recording artist Jordan Pruitt as the opening act. Posted in Uncategorized and tagged 2000s, Disney Channel, Disney Channel Original Movie, Music, Musical, Touring. Bookmark the permalink. On November 28, 1974, the Tomorrowland attraction Star Jets opened in Walt Disney World. The attraction was based on the Disneyland Rocket Jets, which opened in 1967. The attraction was similar to the Dumbo the Flying Elephant attraction; guests board their vehicles and while revolving around a central hub, and have the ability to maneuver the vehicle up and down while continuing the rotation of the ride. For Star Jets, guests boarded jets around a centralized rocket hub, and the height of the attraction allowed guests the ability to look out over the sights of the Magic Kingdom. When tickets were in use in the parks, this attraction was considered a D Ticket ride. 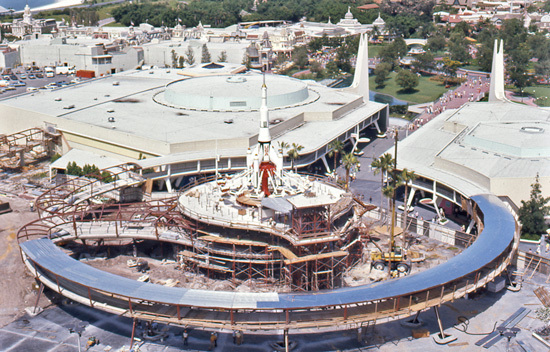 In 1994, the attraction was closed along with many others due to a significant change in the look of Tomorrowland, and was replaced with the Astro Orbiter. Posted in Uncategorized and tagged 1970s, Attraction, Closed, Disney Park, Walt Disney World. Bookmark the permalink. 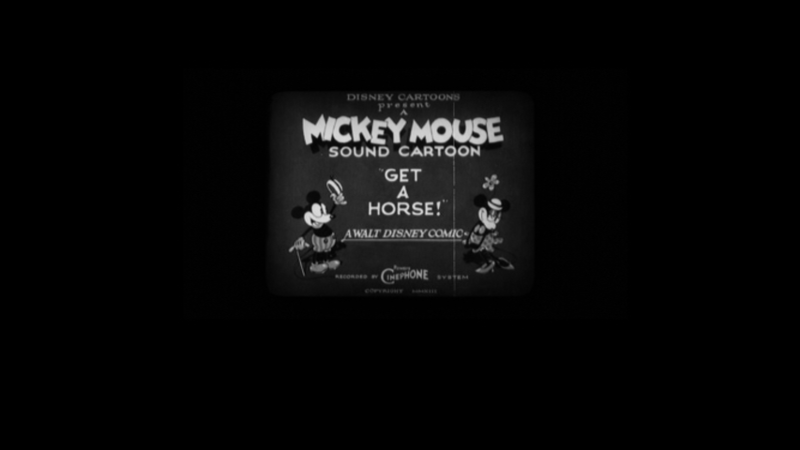 On November 27, 2013, the Mickey Mouse short film Get a Horse! was released to theaters. This was the first theatrical short film featuring Mickey since 1995’s Runaway Brain, and the first short to use Walt Disney as the voice of Mickey since the 1947’s Mickey’s Delayed Date, thanks to archival recording. It also features archival audio of Marcellite Garner as Minnie (along with additional lines by current Minnie voice Russi Taylor), and Billy Bletcher as Peg Leg Pete (with additional dialogue by Will Ryan). It was also the first short to feature the character of Oswald the Lucky Rabbit since Disney’s reacquisition of the character. It was directed by Lauren MacMullan, with story developed by MacMullan, Paul Briggs, Nancy Kruse, and Raymond S. Persi. The short begins with Mickey greeting his friends as they arrive on a hay wagon. As he rushes after them, he jumps out of his shorts and shoes due to his excitement. He tries to get them back, but they refuse to listen. He is finally able to retrieve them, and hops on the wagon as it passes by which also picks up Minnie and Clarabelle Cow. The merriment on the wagon is cut short, however, when Peg Leg Pete comes up behind the group in his car, and honks angrily to let him pass. When he spots Minnie, he decides he would rather have her, and takes her hostage before jostling the wagon with his car. 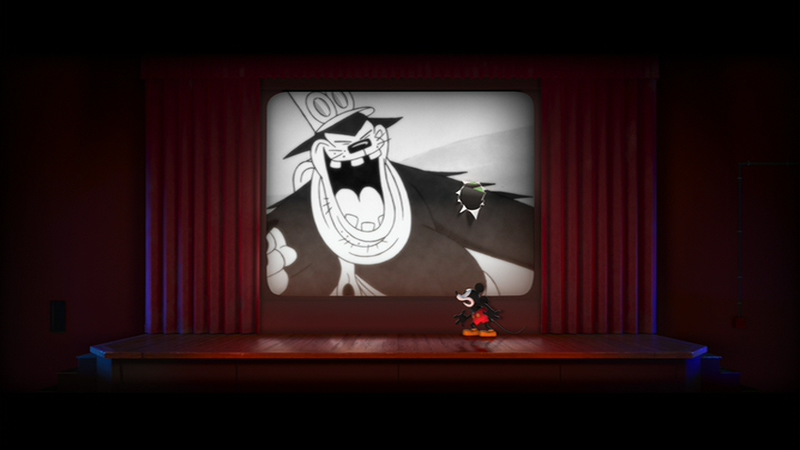 Mickey and Horace Horsecollar are thrown into the movie screen, which puzzles Pete, but gives him an idea to throw Mickey and Horace into the real world. Mickey is shocked about how he looks in the real world, including the red of his shorts, but soon forgets that when he realizes Minnie is in trouble. Try as he might, he has no way of saving her from his position. Suddenly, Horace appears, thoroughly assimilated into the real world (and wearing a Captain America shirt to boot). Mickey calls Horace to attention, and turns him into a makeshift plane, using Milk Duds as bullets to shoot at Pete. The plan, doesn’t work, however, so they try another approach: calling Pete’s phone and spraying him with the contents of a fire extinguisher, turning the animated scene into a winter wonderland. Pete then falls through the ice and lands in a lake, which threatens to flood the theater. Mickey pokes holes in the screen, freeing Minnie and pulling everyone out of the film with them. A chance ensues in and out of the animated and real world, and Mickey is knocked unconscious while Minnie is captured again. After reviving Mickey, the gang then realizes they can manipulate the situation by flipping the screen up and down and back and forth, and Pete is soon injured to the point of unconsciousness. Minnie is saved, and the screen is broken, sending Pete into the real world. The gang then closes the screen, leaving Pete trapped in-between worlds as he tries to get back. Posted in Uncategorized and tagged 2010s, Color, Mickey Mouse, Minnie Mouse, Short film. Bookmark the permalink. 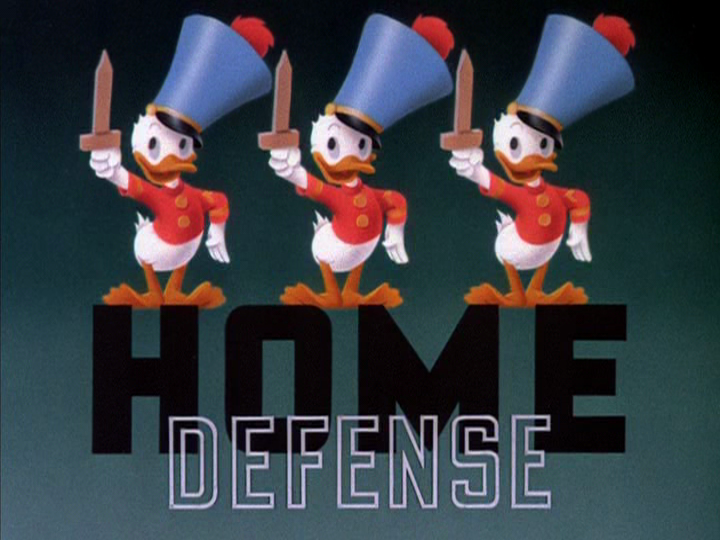 On November 26, 1943, the Donald Duck short film Home Defense was released to theaters. It was directed by Jack King. From his listening post, Donald is falling asleep while his nephews sleep soundly in their tent. Donald tries desperately to stay awake, but fails, dropping his trumpet while he falls to the ground. He ends up snoring into the trumpet, making it sound and waking his nephews, who are shocked to see Donald shirking his duties. They decide to play a prank on their uncle, and send a model airplane flying around the listening post. The sound wakes Donald up, and he believes that there’s a bomber right above them. The nephews then set up their guns, although Donald takes over and shoots the model plane down while the nephews laugh. Donald then sees some parachuters from the plane (another part of the nephews’ prank), and hides in a flowerbed while the nephews make sounds or battle. After one of the dummies lands on Donald’s nose, he realizes the ruse and decides to get back at his nephews by dismissing them from his gun crew. He ignores the tears of his nephews as they march away sadly, and is left alone at his post. Later, he hears a bug buzzing around the post and believes that it’s his nephews playing another prank. When he realizes this isn’t the case, he believes that they are under attack, and quickly calls the boys to help. He restores them to the service, and they set up the cannon to be pointed at the listening post’s speaker, much to the surprise of the bug, who barely manages to escape. 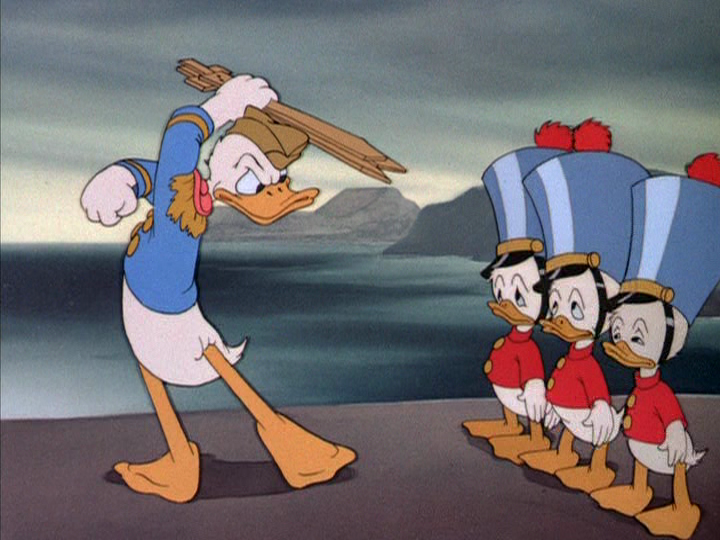 The nephews try to warn Donald before setting off the cannon, but Donald refuses to listen, and his ears are blown out from the cannon fire into the speaker. The nephews laugh as Donald throws a tantrum at his misfortune. Posted in Uncategorized and tagged 1940s, Color, Donald Duck, Huey Dewey and Louie, Short film, World War II. Bookmark the permalink. 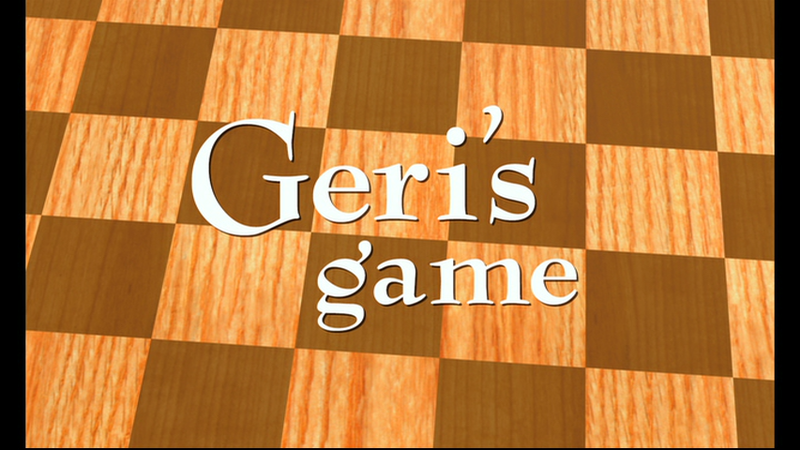 On November 25, 1997, the Pixar short film Geri’s Game was released. The short was released a year before its film pairing with a bug’s life, as it was sent forward for Academy Award consideration. It was also submitted independently from Pixar’s association with Disney. It won the Academy Award for Best Animated Short Film at the 70th Academy Awards. It was written and directed by Jan Pinkava, with Bob Peterson as the voice of Geri. The short begins at a park on a fall day, where Geri is setting up his chess game. He puts on his glasses and moves a white pawn, then waits, while it is revealed to the audience that he is not playing against anyone, and the park is empty. He then takes off his glasses and slowly makes his way over to the other side of the table and makes a vicious move with a black pawn. He carefully gets up again and moves back to the other side, putting on his glasses and playing against himself. This continues, with Geri playing a game against himself with two personalities: the aggressive player on black, and the gentler, less-confident player on white. The aggressive Geri is taking out the gentler Geri’s pieces one by one, leaving gentler Geri rather protective of his Queen. Aggressive Geri teases gentler Geri, as he has nowhere to go. Suddenly, gentler Geri has a heart attack, and falls to the ground. As aggressive Geri checks himself, he realizes that he is fine, and checks on the other Geri. While aggressive Geri isn’t looking, gentler Geri switches the board, so it looks as though he’s been playing black the whole time. Aggressive Geri checks on gentler Geri as he gets back in his seat, then resumes his boastful laughter. Gentler Geri then makes his winning move, shocking aggressive Geri, as he hasn’t realized the ruse. Angered about the loss, aggressive Geri gives up the game, and reluctantly hands over the prize: a set of false teeth. Geri sits back and laughs, alone in the park. Posted in Uncategorized and tagged 1990s, Academy Award Nominated, Academy Award winning, Pixar, Short film. Bookmark the permalink.